Welcome to the web-page of Aleksander-Ehitus! OÜ Aleksander-Ehitus suggests joint dealing with your construction. During the years of our activity we have proved to our partners that we can execute the great and complex construction works. We are doing construction works and repair of rail facilities, general construction works, electric installation works, project and place timber constructions made of cylinder timber, making timber pallets (1,25 t; 2,5 t). The whole course of our development has proved that the chosen direction to achieve the trust of our clients was chosen rightly. We achieved the optimal price-quality relationship of services, indispensable performance of time for completion of spent works and flexible reaction to wishes of the client. 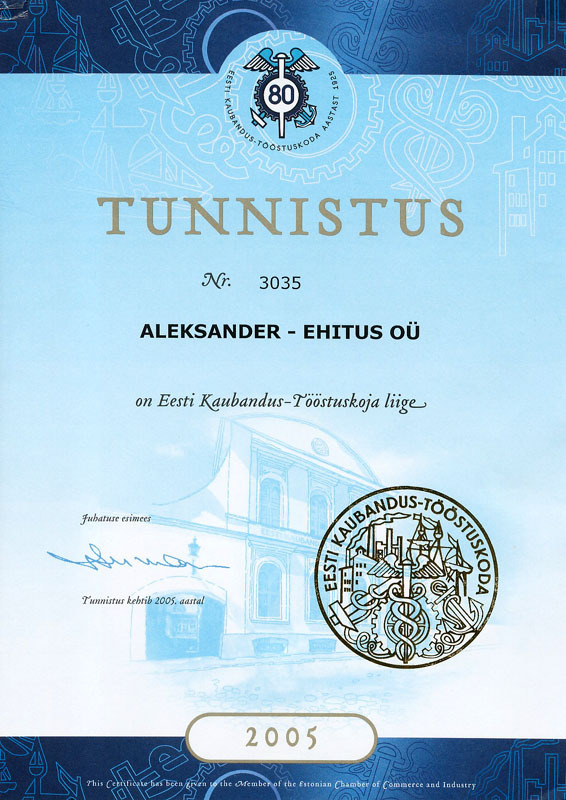 For some years we are the member of Estonian Chamber of Commerce and Industry (look at certificate).